AirPhil Express announces low-cost Air Fare Sale with “Trip Out Over Php 288” sale. It invites you to have a vacation with the rest of the gang and friends this summer. 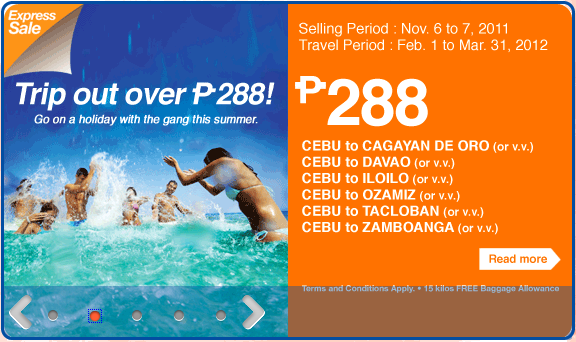 Travel Period inclusive of February 1 to March 31, 2012. Check details below. Cebu to Cagayan de Oro, Davao, Iloilo, Ozamiz, Tacloban and Zamboanga or v.v. Manila to Davao, Cagayan de Oro, Cotabato, Gen. Santos, Ozamiz, Surigao and Zamboanga or v.v. Express Sale is up until November 7, 2011 or until seats last.